Did you know that irritable bowel syndrome (IBS) affects about 15% of the population? Well, I had no idea, to be honest. IBS impacts so many people on a regular basis and they seem to be suffering alone. It’s not a comfortable subject to discuss. While IBS may be embarrassing to you or a difficult to discuss the topic, I want to try to help you be more open to solutions and getting help as you work to discuss your IBS signs and symptoms with a health care professional. Irritable Bowel Syndrome (IBS) has been a nightmare for me the past few years. It is so bad at times, that I actually have had to miss important activities. Like the time I was all ready to go and enjoy the day out with my daughter, shopping and just having a mother/daughter day and out of nowhere those pains would shot through me and cause me so much grief! Then there are times my stomach gets so bloated, that I just want to hide under my covers, in bed all day. IBS is no joke at all, compound all the symptoms I get and it hits me at all the wrong times. It doesn’t matter if I am out to dinner with family and friends, or at the beach with my husband. When it comes, it stops you right in your tracks! That is why I had to give Holigos IBS, to see if it would help me get some semblance of my life back! One of the most common symptoms of IBS is pain and cramping, usually in the abdominal region. You may not realize it but your brain and body work together to make sure that your digestive system is working well. Nerves, as well as hormones, play a key factor in a healthy digestive system. Pain and cramping usually happen in your lower abdomen and will go away when you have a bowel movement. People with IBS can feel that sudden urge to have a bowel movement which can cause stress as they worry about having an episode while out in public. Diarrhea is a common occurrence for IBS and can cause unnecessary mental health strain. Some people have the opposite problem with IBS, such as not being able to have a bowel movement, which is known as constipation. This can increase your pain and cramping in the abdomen region. Another sign or symptom of IBS is gas, bloating and food intolerance. Since you’re all bound up, so to speak or having difficulties with healthy bowel movements, your body will start to bloat and get gas build up from the inability to release a bowel movement. You may also find that some foods that you once loved are starting to create more symptoms of IBS, and in turn, you have to avoid some of your more beloved food choices. Is there help for IBS? Yes. The good news is that that there is help for IBS symptoms. 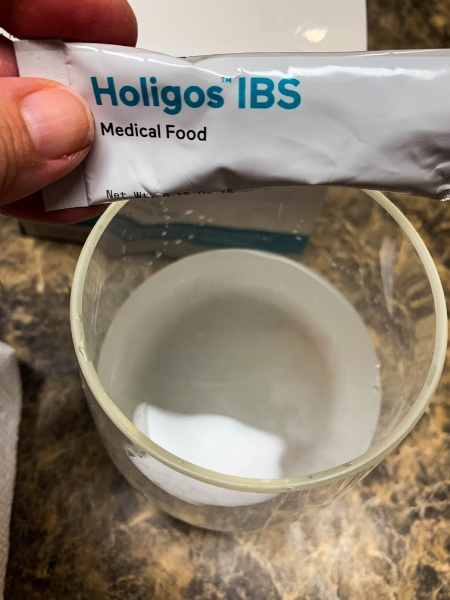 A recent product release is a non-prescription medical food option called Holigos™ IBS. This product helps with the more common symptoms of IBS such as constipation, cramping, and diarrhea. Holigos IBS is formulated with Human-Natural Oligosaccharides. These nutrients are natural to our body and often found in mother’s milk. HNO’s provide our body with the necessary nutrients to encourage a healthy gut. The ingredients in Holigos IBS are certified as safe by the Food and Drug Administration (FDA). More than 85% of patients in a recently completed clinical trial in the US had clinically significant improvement in IBS symptoms. When you opt to use Holigos IBS to help with IBS, you’ll find that this product creates a balanced immune system, improves gut microbiome, strengthens the intestinal barrier. Holigos IBS is free from gluten, artificial colors, flavors, yeast, soy, and sweeteners. Mixes with anything – It can be added to all food or drinks, cold or warm. Neutral or no taste or smell. 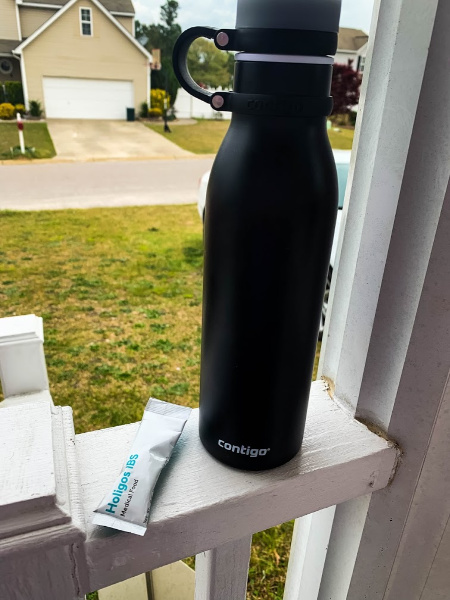 Convenient on-the-go stick packs. No refrigeration needed. Increased mood and reduced stress from IBS symptoms. Helps you nutritionally manage IBS symptoms including abdominal pain, bloating, diarrhea and constipation and Holigos IBS is clinically proven to reduce IBS symptoms from severe to mild! 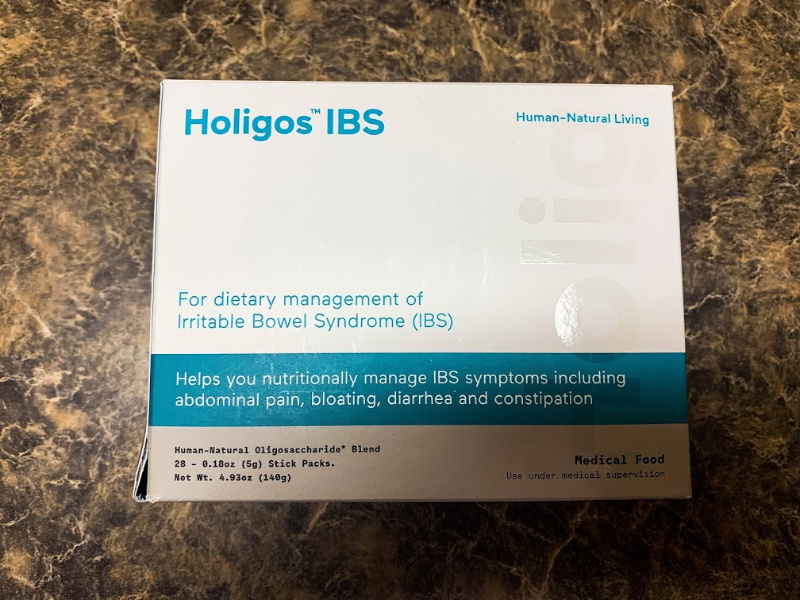 Since I have started to use Holigos IBS, I have noticed some changes in my symptoms and I really feel it is working for me. I have more good days than bad days now. I am able to do more activities with my family and friends and less of the hiding in my bedroom so I am closer to the bathroom days. I feel better and I am actually much happier now, all thanks to Holigos IBS! If you’re ready to get started, then I highly advise you to look into Holigos IBS to help you with your IBS. Learn more about Holigos at www.holigos.com and receive 30% off your purchase of Holigos IBS by using code TryHoligos30 at checkout! Thankfully, I have never been afflicted by IBS. I do although know of others who have and it can be a really tough road to go down. Thank you for sharing this information. Hopefully it helps others to better deal with their illness.